This area of research aims to illuminate one of the most underdeveloped realms of solid state materials science – the physics and control of thermal effects in materials with ferroic order. This work focuses on the development of materials and know-how to enable pyroelectric energy conversion of waste heat to electrical energy, electrocaloric solid state cooling, thermally-driven electron emission, and much more. Our comprehensive approach includes aspects of materials design, synthesis, device fabrication, and advanced characterization development and utilization. Recent work in this regard has provided understanding about the role of domain walls in pyroelectric response, produced novel methods for studying heat-based effects in ferroic thin-film capacitors, and demonstrated colossal energy conversion processes in materials. The Boltzmann distribution of electrons poses a fundamental barrier to lowering energy dissipation in conventional electronics, termed as the Boltzmann Tyranny. Negative capacitance in ferroelectric materials, which stems from the stored energy of a phase transition, could provide a solution. Here we present the observation of negative capacitance in a thin, epitaxial ferroelectric film. When a voltage pulse is applied, the voltage across the ferroelectric capacitor is found to be decreasing with time—in exactly the opposite direction to which voltage for a regular capacitor should change. Analysis of this behavior presents an unprecedented insight into the intrinsic energy profile of the ferroelectric material and could pave the way Beyond Moore’s Law. Chirality, OR handedness. 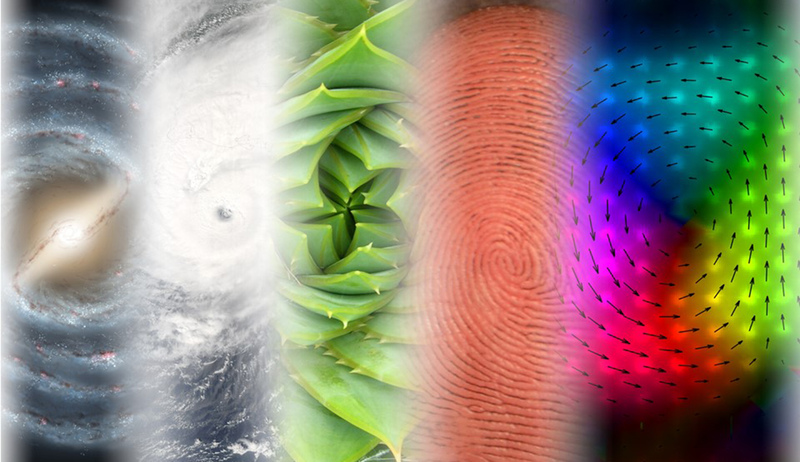 determines many important properties in nature—the strength of the weak interactions in particle physics, the binding of enzymes with naturally occurring amino acids or sugars, reactions that are fundamental for life. In condensed matter physics, the prediction of topologically protected magnetic skyrmions and related spin textures in chiral magnets has stimulated significant research. 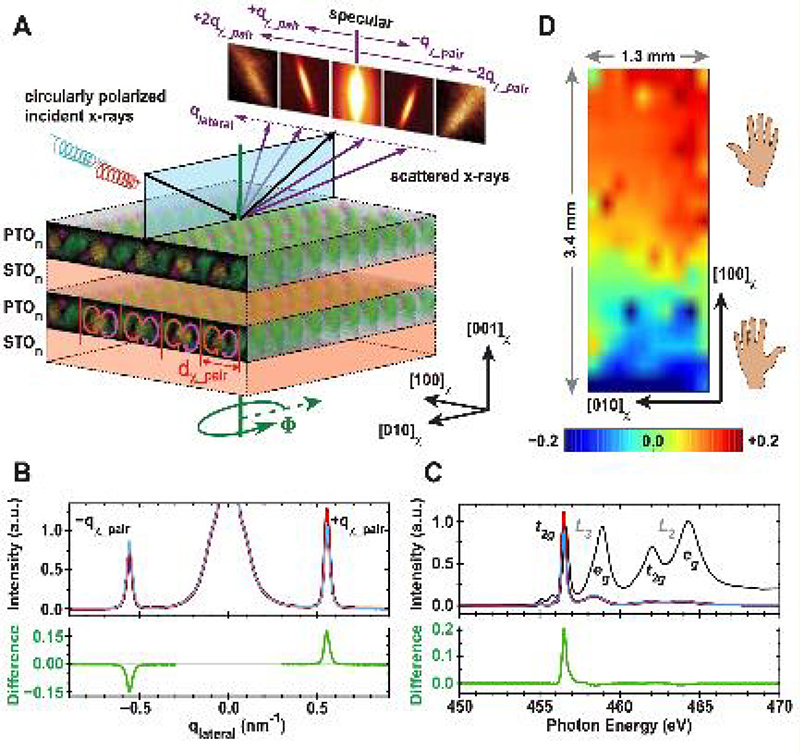 We have demonstrated the electrical counterparts in PbTiO3/SrTiO3 superlattices that exhibit a continuous rotation of ferroelectric polarization. Using resonant soft x-ray diffraction we observe a strong circular dichroism from the interaction between circularly polarized light and the chiral electric polarization texture that emerges in such superlattices. Second-principles simulations predict the chirality to reside within complex three-dimensional polarization textures. The handedness of the texture can be topologically characterized by the sign of the helicity number of the chiral line defects. This coupling between the optical and novel polar properties could be exploited to encode chiral signatures into photon or electron beams for information processing. The complex interplay of spin, charge, orbital and lattice degrees of freedom provides a plethora of exotic phases and physical phenomena. 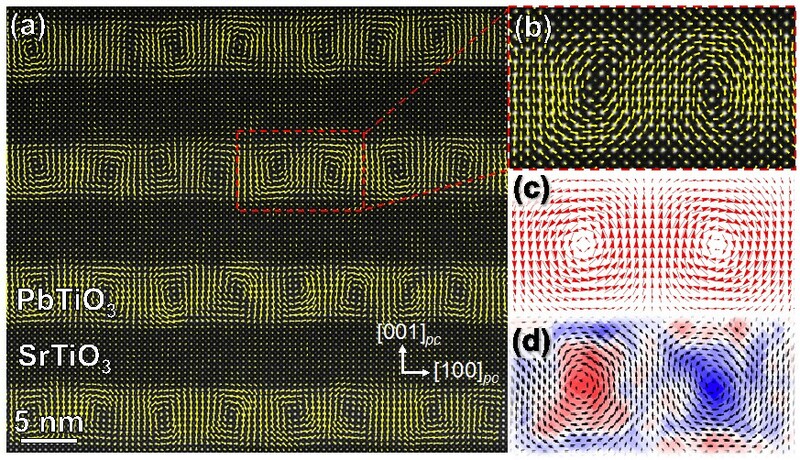 In recent years, complex spin topologies such as nanometer-scale clockwise–anticlockwise arrays that are reminiscent of rotational spin topologies—by making use of the competition between charge, orbital and lattice degrees of freedom in lead titanate and strontium titanate superlattices. Atomic-scale mapping of the polar atomic displacements by STEM reveals long-range ordered clockwise–anticlockwise arrays that exhibit nearly continuous polarization rotation. Phase-field modeling and ab initio calculations confirm that the vortex array is the low-energy state for a range of superlattice periods. These observations have implications for the creation of new states of matter (such as dipolar skyrmions, hedgehog states) and associated phenomena in ferroic materials, such as electrically controllable chirality. The study of systems exhibiting phase competition, order parameter coexistence, and emergent order parameter topologies constitutes a major part of modern condensed matter physics. Here, we observe that in PbTiO3/SrTiO3 superlattices all three of these effects can be found. We observe phase coexistence mediated by a first-order phase transition between an emergent, low-temperature vortex phase with electric toroidal order and a high-temperature ferroelectric a1/a2 phase, in a mesoscale, fiber-textured, hierarchical superstructure. Application of electric fields to this mixed-phase system, results in deterministic interconversion between the vortex and the ferroelectric phases concomitant with order of magnitude changes in piezoelectric and nonlinear optical responses and promise for new cross-coupled functionalities.